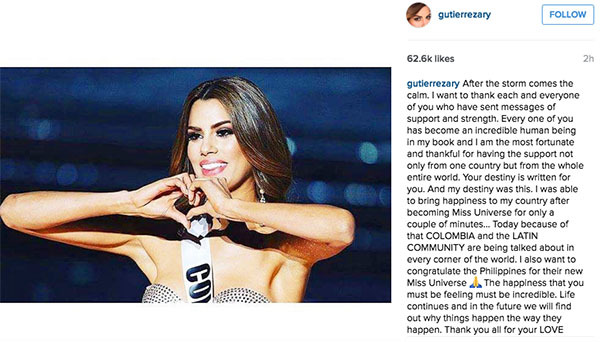 Miss Colombia Ariadna Gutierrez finally congratulates Miss Philippines Pia Wurtzbach for winning Miss Universe 2015. “Your destiny is written for you. And my destiny was this. I was able to bring happiness to my country after becoming Miss Universe for only a couple of minutes… Today because of that COLOMBIA and the LATIN COMMUNITY are being talked about in every corner of the world,” she added. “Life continues and in the future we will find out why things happen the way they happen. 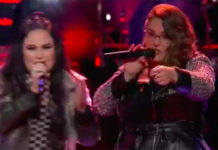 Thank you all for your LOVE SUPPORT and KINDNESS,” Ariadna said. On Sunday, the Miss Universe 2015 pageant ended with controversy after event host Steve Harvey crown the wrong queen. Harvey mistakenly announced Miss Colombia as winner and Miss Philippines as runner-up.